There’s this stretch of America that is truly the road less traveled. Michigan and Wisconsin along Lake Superior, and into the Lad of 10,000 Lakes itself, Minnesota. Unless you’re up there already, there’s rarely a reason to go. Or so it seems when plotting out your route on Google Maps or giving your GPS the freedom to run your particular show. On further inspection, there’s beauty and sanity to save. If you were planning on taking the whitewater rapids worth of freeway that is the I-90/I-80 corridor through Ohio, Indiana and Illinois, you’ve probably never done that trip before. It’s a bit of a nightmare, with speeds switching from bumper to bumper 85mph traffic to dead stand stills for hours at a time even on a freeway that charges a toll. Heavy traffic in the gorgeous city of Chicago can give a person a bad impression of that fine city. The solution? There are National Parks and then there are a variety of “lesser” designated places in the National Park System. National Forests, for example, can still be used for residences, businesses and industry, provided they conform to varying amounts of regulation. National Lakeshores, on the other hand, are often every bit as beautiful as big parks like Yellowstone and Yosemite, the key difference? Often no admission fees and they involve long stretches of where the most beautiful lakes America has to offer but up against the land of the free. There are only four places designated as National Lakeshores in the US, two of which are in Michigan, and two of which we’ll traverse on this little roadtrip of ours. The first being Pictured Rocks in Munising, Michigan. I’ll briefly try and describe it. Imagine the teal blue tint of otherwise crystal clear water, a sepia toned rainbow of rocks protruding from it all, each tiny peninsula jutting out from the cliffside another face to imagine. It’s like lying on your back in a summer’s field looking up at the clouds and imagining them to be Indian heads and castles, except you’re floating on a body of water large enough to feel like an ocean and the clouds are instead 200′ sandstone cliffs comprised of bands of history in yellow, purple, red and brown. Michigan’s Upper Peninsula has a lot to offer. Nothing, in my not always so humble opinion, quite compares with Munising. Some 2000 people live in a town just small enough to feel like you could call it your own, become an actual local with little more effort than surviving a winter up here. Still, the summertime draw of great fishing and boating combined with winter’s allure, snowmobiles and ice fishing shanties, keeps the town’s business strong. Forget Folgers, the best part of waking up in Munising comes with a trip through often foggy mornings to Falling Rock Cafe. Munising is not a liberal town. 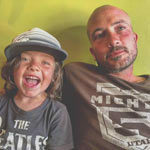 Locals are more likely to own a gun rack than a quality espresso machine, but luckily the owners of Falling Rock can see the value in a good strong cup of something that didn’t come in crystalline form out of the can. Mugs from tourists who regularly return to Munising are hung on the wall. Abundant are books for sale by local authors and an entire library of reading material to peruse over your favorite latte, iced coffee or, if you’re the type, just a regular cup of coffee. Cute girls and competent cooks will get you set up with a quiche and your beverage of choice. Little ones on board? They’ve got toys, nice and grimy and well used of course, to occupy their time while you gather your parental semblance of sanity for the day. Looking to get out on the water? Skip the $36 per person ($10 for kids 6-12, $1 for the younger ones) Pictured Rocks Cruises and rent yourself your very own pontoon boat for about $150 from Seaberg Pontoon Rentals. They’ll teach you the basics of operating a boat on Lake Superior, provide you a map with which you can find a shipwreck visible from the lake’s surface and cruise all up and down the Pictured Rocks themselves. Their pontoons hold 14 people and come with a bucket to take care of business. Want to jump in the water? Make sure you’ve got a good heart, it’s absolutely frigid even in the summer. But as much as you might have making waves and catching rays on the pontoon, some people want to actually catch a fish. It’ll run you $350 for up to three people, but you’re almost guaranteed to bring home some Lake Trout for dinner with Kimar’s Charters, 18 miles west of town on Michigan 28. 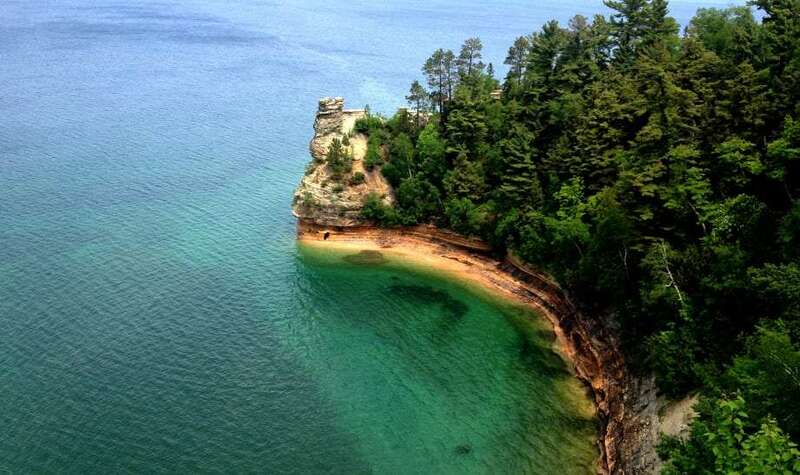 Finally, the Pictured Rocks aren’t just the cliffs seen by water, drive along Michigan 58 headed east and be sure to check out short hikes and easy views of Superior at Miner’s Falls and Miner’s Beach, the Log Slide Overlook, and climb around the Grand Sable Dunes. Need a place to stay? Scotty’s Motel is dirt cheap and similarly accommodated, but right in the middle of town. Our fellow clientele at the time we stayed were, to put it mildly, a bit seedy. Alger Falls Motel, 3 miles south of town, treated us right as far as a middle priced motel goes, and was clean and staffed with incredibly friendly folk. On the higher end, check out Hiawatha’s Hideaways for rentals ranging from small cabins deep in the woods to large historic houses right downtown. Michigan’s Route 28 is your best (and just about only) bet for leaving town and heading on to Wisconsin. A truly scenic drive that hugs Superior much of the way, it also provides plenty of opportunities to get even further off this unbeaten path and explore some beautiful Pure Michigan scenery. If you’re in no rush, head north on US 41 just after Parent Lake and take that through the quaint small cities of Houghton and Hancock, and then on to Copper Bay, one of those small towns on the water that’s far enough away from everything to see the stars but still stocked with the essentials one might need to, say, take a boat over to Isle Royal National Park. The largest island in Lake Superior, Isle Royal is one of those “bring what you need, we don’t have much to offer but solitude and nature” kind of places. Loop back to our main route via Michigan 26 for more lakeshore gorgeous driving time. As you leave the Keweenaw Peninsula, detour slightly north to Porcupine Mountains State Park for a quick hike or a picnic, or just to give yourself a little more time in the Great Lakes State. You’ll hop onto US Route 2 to finish out the state, before grabbing Wisconsin 13 north to Bayfield. Remember the mention of this route taking you along two National Lakeshores? Well you’re coming up on the second, Apostle Islands. Twenty one islands off the tip of northern Wisconsin’s coast are full of old growth forest, sandstone caves and historic lighthouses. 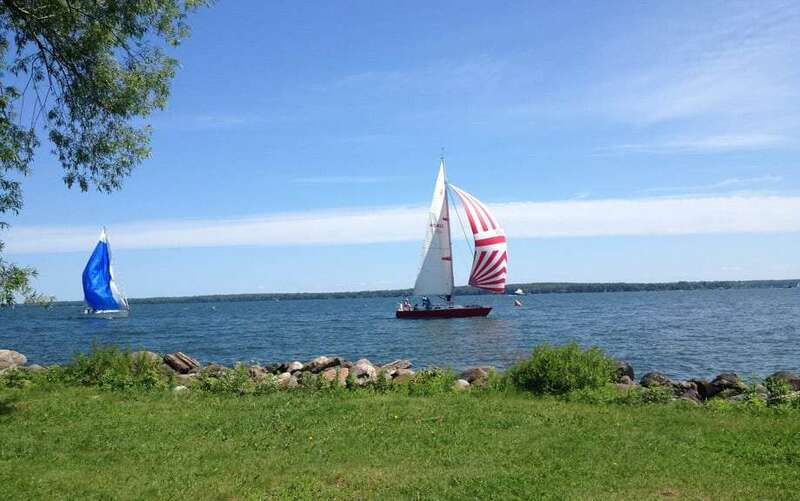 Sailboats boast brilliant colors between the islands and the mainland, setting a backdrop for the town of Bayfield’s vibe which seems pulled straight from a 80’s vacation movie. If you love those rare small towns that manage to keep the local businesses thriving and the big chains far down the highway, that’s Bayfield. Coffee shops, bookstores, restaurants with views of the water and bars serving up local beers are in abundance. McDonalds and the like are non-existant. Big Water Coffee Roasters is your best bet for getting a hot cup and yes, they roast the beans themselves. Bonus points on that and the whole place has a feel that simultaneously accommodates families chatting loudly and WiFi enthusiasts checking up on Facebook in solitude. Looking for an adult beverage instead? Hit up the Bayfield Inn’s Lounge Deck. Atop the hotel, it provides the perfect liquid combination: alcohol and a panoramic view of Lake Superior. We stayed at Apostle Islands Area Campground, the closest RV park to the city. A nice, wooded setting with a playground and pay showers, kind of expensive and a lot of rules, but we’d probably do the same in the future. I walked to town one day, a little over a mile along a highway, but you could ride a bike along the beautiful Lakeshore Drive and be downtown in fifteen minutes or so. We rounded the peninsula, further along Wisconsin 13, which adds about 3 miles and fifteen minutes to your total travel time, but keeps you along the water on the way. 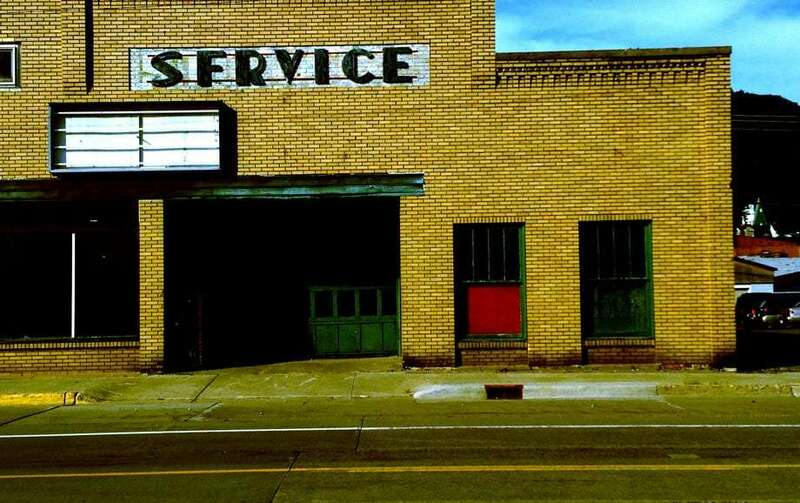 I’d recommend skipping Duluth altogether, it’s a big, strip mally city full of industry, though that in and of itself can be beautiful in a way. Update! A very adamant reader wrote in and wanted to assure me that Duluth is, in fact, totally worth visiting. That the downtown area is full of small, local businesses, there are plenty of outdoor activities, it’s got a strong economy and is quite the epicenter for intellectuals. Once in Minnesota (say it, “sōda”), skip Interstate 35 and shortcut down state route 23 or parallel I-35 via Minnesota 61 to drive next to and between some of the state’s 10,000 lakes. You’ll eventually cut west on MN-18 until you smack dab into Mille Lacs Lake, the state’s second largest inland lake and a treat for the eyes and paddling muscles. 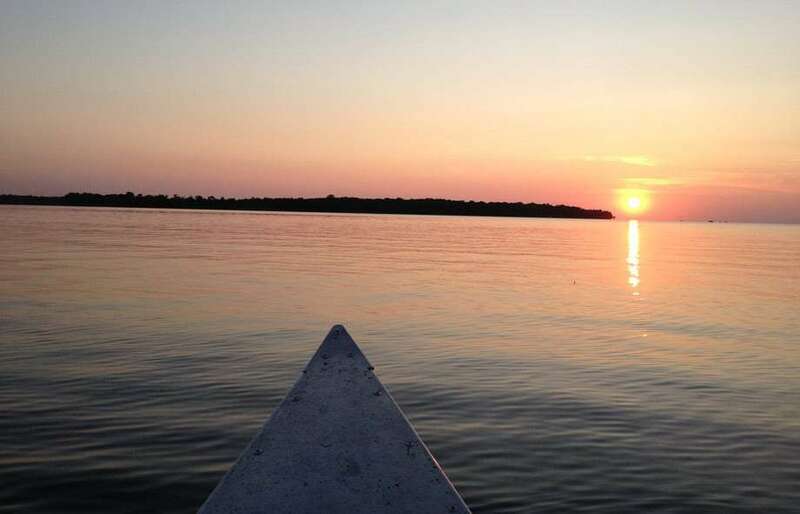 The tip of a canoe pierces slowly through the water as the sun sets over Mille Lacs Lake. Rent a canoe from McQuoids Inn and keep yourself from tipping as you explore the reeds protruding from the lake along with small motorboat enthusiasts. Time it so you can watch the sun set over the water, leaving you plenty of time to row back in and return your vessel after watching a giant color-changing sun like they must have based the Japanese flag on. Drive north from Isle along MN-18/47 to hug the lake loop and find yourself any one of a variety of little beach pullovers perfect for doling out sandwiches and getting your hair wet. Back in Isle, hit up Father Hennepin State Park. At $5 / day, they’ve got a beautiful beach perfect for playing with young ones or diving into the water to catch a frisbee. Fishermen and drinkers love Mille Lacs, for its many boating / beachfront bar resorts and the typically relaxed nature of the place. Not everyone will have the time or desire to head so north in this nation, but for those who do they’ll find themselves in a place, and surrounded by people with accents, different than nearly anywhere else in our find lane.